If you loved horses as a kid, you may have played with or collected Breyer or similar model horses. I gave mine too much attention - galloping them across the kitchen tile until a plastic leg snapped off; making bridles out of scraps of cheap jewelry and leather shoelaces; even repainting a few of the more boring ones. One Shetland Pony ended up green with gold eyes and hooves. I recently found a whole hobby world based on just these impulses - virtual horse shows of model horses which have been custom painted, adorned, and even modified by the participating artists. The simplest custom jobs involve creative repainting - often in more unusual or showy colors. The more elaborate projects include adding real hair manes and tails, hand-made miniature saddles, bridles and costumes, and even repositioning limbs, heads and necks to get just the right pose. 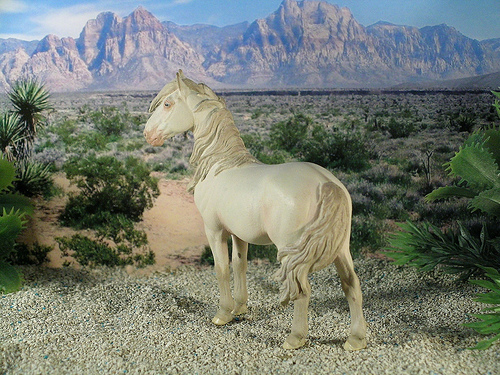 Hobbyists compete at real world conventions or online, through virtual horse photo shows. This club has some fancy models in their online gallery. And this site features some nice competition photos.